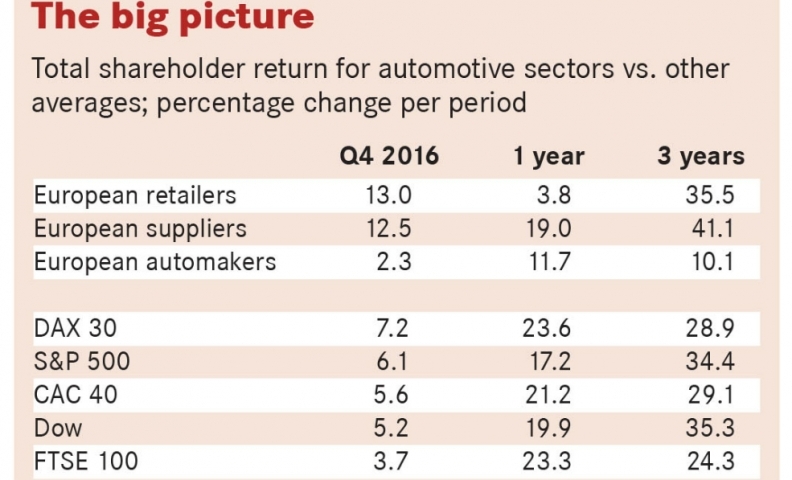 Shareholder value growth slowed considerably for automakers in the first three months of 2017 but improved for partsmakers and car retailers. 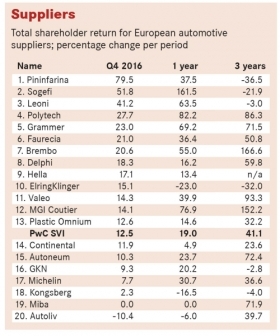 The latest Automotive News Europe/PricewaterhouseCoopers Transaction Services Shareholder Value Indices show that automakers grew just 2.3 percent, compared with gains of 11 percent in Q3 and 15 percent in Q4 of last year. Meanwhile, suppliers gained 12.5 percent in Q1 compared with a 3.4 percent rise in the last quarter of 2016 and retailers were up 13 percent (5.2 percent in Q4). The star performer in the quarter was PSA Group, which had a 21.8 percent increase in shareholder value. The automaker's stock price benefited from news that it has struck a deal with General Motors to buy its Europe brands, Opel and Vauxhall, for $1.3 billion and GM Europe's financial operations for $900 million. For the second consecutive quarter Fiat Chrysler delivered a strong performance, following up its Q4 2016 gain of 53.4 percent with an increase of 18.3 percent in Q1 this year. This comes in the wake of rising speculation – fueled largely by comments from Fiat Chrysler Automobiles CEO Sergio Marchionne – about a possible tie-up between FCA and Volkswagen Group. 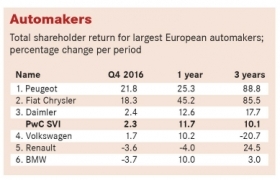 But the performance of other manufacturers, including VW, was much weaker. Daimler was up just 2.4 percent and VW 1.7 percent, while Renault fell 3.6 percent and BMW's value to its shareholders decline 3.7 percent. The German premium manufacturer was affected by news of a pending industrial dispute over pensions at four UK plants. This was despite encouraging news from China, where sales of its 50-50 joint venture there, Brilliance China Automotive Holdings, improved 44 percent year-on-year in the first two months of 2017 and growth of at least 20 percent is now forecast for the full year in a Chinese market that it expected to rise just 5 percent. Among suppliers, Pininfarina delivered an exceptional 79.5 percent gain in Q1, buoyed by news that the company made a net profit of 20.5 million euros last year against a loss of 18.2 million euros in 2015 and that the outlook for the current year is positive. The design and engineering company, in which India's Mahindra & Mahindra acquired a controlling interest in 2015, has also entered into a four-year, $68 million agreement with electric motor and battery supplier Hybrid Kinetic to develop an electric vehicle in what is becoming the increasingly crowded market for luxury vehicles with alternative powertrains. Particularly strong performances were also delivered by Italian filtration specialist Sogefi, up 51.8 percent, and the German-based wiring supplier Leoni, which improved 41.2 percent. Sogefi has become a consistently strong performer in recent months, achieving shareholder value gains of 35.3 percent in Q4 last year and 36.9 percent in the quarter before that up. In February, Sogefi reported a 32.2 percent increase in earnings to 153 million euros on a 5 percent increase in revenues. The company also announced plans to build new factory in Morocco, Sogefi's first industrial site in Africa. Leoni was boosted by better-than-expected earnings of 78 million euros in 2016 and the acquisition of a company that will contribute software, simulation and cloud-based data analysis competences to its skills portfolio. 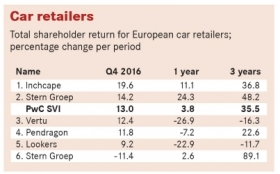 Overall, retailers performed well during the first quarter, with double-digit percentage gains enjoyed by four of the companies tracked by ANE and PwC: Inchcape (up 19.6 percent), Stern Groep (up 14.2 percent), Vertu Motors (up 12.4 percent) and Pendragon, (up 11.8 percent). The fifth, Lookers, improved 9.2 percent. The only exception to this positive trend was Scandinavia's largest car retailer, Bilia, which experienced an 11.4 percent decline in its value to shareholders.